About The Huron Pizza House! Huron Pizza House is located at 812 S. Main St.
Huron Pizza House has been serving up great, award-winning pizza since 1991. Owner & operator Matt Cummings got his start making pizzas for Barb "The Pizza Queen" Leber at Pizza House West, Sandusky in 1988. From there he went on to manage and soon buy the Huron location in 1992. Some 20 years later the Huron Pizza House strives to be your hometown pizzeria. From our homemade sauce, fresh cut produce, & fine italian meats, to using the best quality Grande® Cheese. Huron Pizza House cannot be beat! From the outside, you don't realize what's offered inside. Upon entering, you will be welcomed by a large cozy, nautical themed restaurant offering full service dining. Plenty of room for all your needs from just the family night out, to having an enitire family celebration. Kids be sure to check out the aquarium! We realize that there are plenty of options when it comes to dining out & want you to know that we will strive to serve you the highest quality product at a reasonable price. 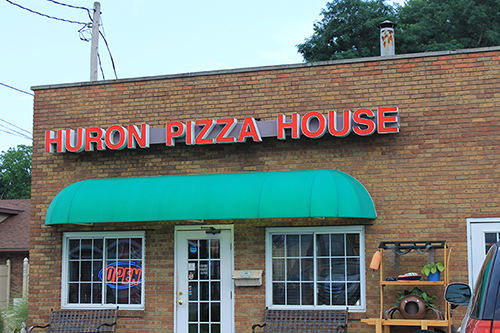 So Stop on in & check out why all of Huron is talking about the Huron Pizza House! ©2019 Huron Pizza House, All Rights Reserved.